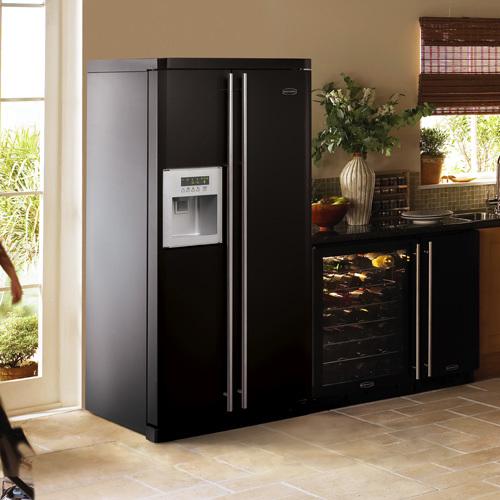 The SXS is an American style side by side refrigerator which comes in black, stainless steel and cream. Brand new to Rangemaster is a range of technologically advanced, high quality side by side fridge/freezers, developed to co-ordinate beautifully with our range cookers. These eye catching appliances offer a host of practical features including ice-making, both crushed and cubed, a filtered chilled water dispenser, fuzzy logic processor and spacious frost free compartments to preserve your food at just the right conditions regardless of outside temperature. With the Rangemaster Fuzzy logic processor on board our appliances think for themselves! Amongst other things, it controls the internal temperature. Five separate sensors constantly monitor the external ambient conditions around the fridge/freezer while the intelligent processor maintains an even temperature inside and so making the most economic use of energy. Both fridge and freezer are ‘A’ rated.